This is a timely message to have an overview of the year that was about to be just concluded, so many goals we're started, so many people put their dreams on hold either because of interaction, distraction by the entrance of the wrong people into their lives who they feel will fill the vacuum or the lack of certain factors in their life. The truth of the matter is that your ability to achieve certain goals or success must not be placed on the entrance or exit of people in your life. Let's take a close look at what procrastination can or will do to you if you let it. I want you to take note or underline the word "delaying, especially something that requires immediate attention". I was speaking to a young lady during an interview as she was applying for a job at our company. After asking her several questions, she gave me great answers that every interviewer would like to hear. After I was almost done with the interview, I asked her about her highest form of education which was relevant to the job. She responded by saying I am 10 credit away from graduating college as she dropped out of college since 2006. With her exact word “I am planning to go back", with a disappointing look on my face, I told her you have been trying to go back 7 years ago? This is what procrastination does, it cripples you if you allow it, I will try to lose weight but every time it's gym time you say you go the next day and the next day. 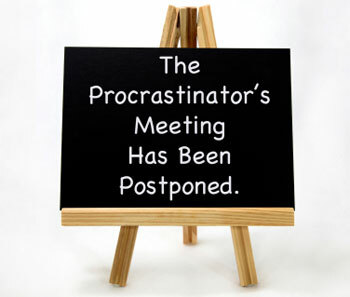 Procrastination is like a deadly cancer, you cannot let it live with you and it's got to die. Friends the truth of the matter is that procrastination is a killer of destiny, holds you stagnant. Procrastination makes you make the unimportant important, the necessary unnecessary. Procrastination is like a bound that if you let it, it will hold you bound even till grave. But there comes a time where you say no more baby, I shake you off, dust my foot , wipe the cold at my eye, look up to Heaven from where cometh my help. Father saw him and felt compassion, and ran and embraced him and kissed him. The prodigal son came to his senses having wasted all his inheritance that he demanded from his father while he was still alive. The prodigal son understood that he had messed up, understood he had lavished his resources, understood he had jump the gun, understood he had ate the forbidden fruit. Made up his mind that no more seating here in waste, no more seating in regret, no more what if, or what may, but decided I will take my destiny in my hand. I got myself here, I will get myself out. Here is the good news, you have got help. The Bible says the son of man has come to give you life and even more abundant. I prophecy over your life that every spirit of procrastination to lose its strong grip over your life, loosen Its grip over your marriage, loosen its grip over lack of having time to living an healthy life style. Whatever you are struggling with that you seem not to be able to get over the hurdle, the Bible says who the son of God sets free shall be free indeed in Jesus name. Lose your hold; you are free in the name of Jesus.